I've loved Dr. Seuss since I was a child. I'm sure at one point or another, I've read every Seuss book available (and own most of them), so when I heard that there was going to be a "new" collection of stories published, both me and my inner child squealed in delight! The stories are taken from magazines that were published between the mid 1940s to late 1950s, and hadn't really been seen since these magazines had originally been published. These stories are quite clearly from early on in Dr. Seuss' writing career. They carry his inherit flare and whit that is prominent in all his writing, but they don't quite carry the "lesson learned" aspect that he became known for. Not that these elements aren't in these stories (such as "The Bippolo Seed," which deals with the dangers of greed), but they are only there marginally. 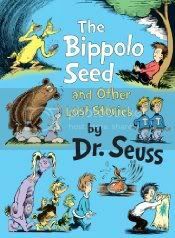 It seems to me that Dr. Seuss wrote these tales more for pleasure and fun than really trying to bestow any kind of wisdom to his young readers as he would in his later books. If you're a fan of Dr. Seuss I'd highly recommend this book. The drawings have been reproduced in a color palette that wasn't available to magazine's of the time, but matches perfectly with the colors used in his published books. The foreword by renowned Seuss scholar, Charles Cohen (who tracked down each of the stories in the collection), is a fascinating look into the history around when each of the story's were written and helps show how Dr. Suess helped change how books were written for children. This is a real treat for any Seuss fan!